This month we’re off to ZSL London Zoo to meet some lovelorn laughing thrushes, endangered snails, and the Cilla Black of Sumatran Tigers. Plus, a sneak preview of this year’s Genetics Society JBS Haldane lecture, and a gene of the month that likes a tipple. This is the Naked Genetics podcast for November 2017, brought to you in association with The Genetics Society. Can we save the blue-crowned laughing thrush? Earlier this month Kat Arney took a trip to London zoo. It wasn’t purely for fun - she was there to meet some of the team at ZSL London Zoo who are responsible for protecting and conserving species that are critically endangered in the wild. It’s a vital part of ZSL’s work, but - as she discovered when she started her visit in the tropical birdhouse - it’s not quite as simple as just sticking some animals together and letting nature take its course. There’s quite a lot of genetics to take into account too as Laura Gardner,curator of birds at ZSL London Zoo, explained. Laura - We’re standing in the middle of the Blackburn Pavilion which is the tropical birdhouse at London. 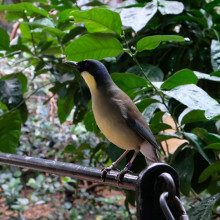 Sitting right in front of us is one of our 5 blue-crowned laughingthrush. This is a critically endangered Chinese passerine, endemic to China. The total numbers of this bird in the wild are fewer than 320 so, really critically endangered. 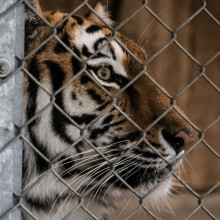 The captive population in zoos across North America, Europe, and Asia are collaborating to actually secure an insurance population, should anything happen to that remnant population back in China. So we have 269 birds within the zoo population. Kat - On a genetic level, how do you manage that population? How do you work out who’s who and who’s allowed to breed with who to make sure that that population continues? Laura - Well, it’s a bit like online dating. It’s matchmaking with science thrown in. So we look at the genetics and the demographics of the species in order to manage that species long term. Kat - What are the risks of this captive population not being maintained, of becoming inbred? Laura - Well essentially, if the species becomes too inbred, it then won't be a viable breeding population and ultimately that will disappear which will, I think be really, really sad. We don’t know how secure the birds are left in the wild. We know where the birds go to to breed every year and those areas are protected by the Forestry Bureau. But the birds disperse at the end of August every year and we just don’t know where they go. So potentially, they could all colonise over winter in the same areas. That area then becomes urbanised, developed, we lose that habitat, and potentially, all of the species upon which that habitat depends, and everything will be gone. So, this insurance population is vitally important. Kat - You said there are 5 female birds here. From my knowledge of biology, females don’t tend to make more birds on their own. Where are the boys? Laura - Absolutely and this is an important part. We actually had to get quite clever with how we manage our captive populations. A lot of it is the mean kinship for population. That is to say how related any one of these individual birds is to the others within the zoo population. You can get several pairs that are very prolific and well-represented. So, their lineage is well-represented within that population. But if they produce too many chicks, and other pairs aren't breeding so successfully, you end up with a glut of birds that are actually closely related. So what this group here represents is closely related group of female birds and we just don’t have at this point in time, suitable unrelated males to pair with them. We’ve got breeding recommendations for the birds or for the zoos that hold the pairs of birds that have underrepresented lineages. Once those birds reproduce, we will then hopefully have some males. These females will then go and join these males at other zoological collections protective breeding. And that’s what makes your population sustainable. Kat - What is the future for these birds? What's the long term plan? Laura - The long term plan is a combination. It’s a very collaborative response. This is a globally managed population and there's, I think, 16 species which are currently globally managed. So, the idea of the global species management plans is to bring all of the regional populations managed under one umbrella which makes sure that there's more viable long term population management. It also includes things like husbandry, welfare, looking at veterinary issues as well, all of which would not only impact upon the captive population within our zoos, but also, have significant implications for the wild population –disease surveillance, managing parasites – all of the things that could impact upon the wild population. Kat - You’ve described a huge amount of human effort that’s going on to understand these populations, to work out their genetics to keep them going, and make them sustainable, but what about human efforts that aren't helping with conservation? Laura - Absolutely. I think we’re at this point with many of our threatened species because of the behaviours of people and how we impact upon the environment has a direct consequence for the species that depend upon that environment - things like land use changes, urbanisation, the building of roads, and infrastructure that supports expanding human populations quite often will have a very negative detrimental impact upon the species that normally will live within that habitat. There are also more direct human behaviours such as the illegal wildlife trade and that’s a real focus for ZSL at the moment and many zoological collections are working collaboratively with conservation organisations and other partners out in these areas, particular across Asia where you’ve got the songbird trade and the illegal wildlife trade – both of which significantly impact on these Asian songbird populations. Matchmaking tigers is a tricky genetic job. Once Kat Arney escaped from the delightfully relaxing bird pavilion, she went off to the other side of London Zoo in search of larger prey - or rather, predators. 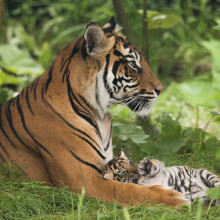 She chatted with Jo Cook, from ZSL London Zoo, about tiger dating and what population management actually means for a species like the Sumatran tiger. Jo - I'm Jo Cook. I'm a Conservation Breeding Specialist for Zoological Society of London and we’re currently in our Sumatran tiger habitat at London Zoo and that is one of the programmes I manage for the European region. Kat - So you're basically the Cilla Black of tigers? Jo - That’s not been said before but yes, I guess I am. Kat - We’re here in the tiger enclosure, your lovely tiger territory here. We can see a tiger up there just relaxing. Presumably, that tiger is in your breeding programme. Jo - That’s right, yeah. We’ve got a pair of adult tigers here, Jae Jae and Melati, and this is their second litter that they’ve had as part of the breeding programme. In a few months’ time, the youngsters will be going off to other zoos to continue the programme and make sure that their genes are captured for the future. Kat - Unfortunately at this point the tiger enclosure was over-run by an invasive species - noisy small children - so Jo and I headed up to her office to chat about tiger dating in more detail, and what population management actually means for a species like the Sumatran tiger. Jo - So for us, it’s maintaining a captive population that is genetically and behaviourally diverse so that we can support their wild counterparts and that can be in terms of raising awareness and funds for in situ conservation but also, maintaining a lifeboat population if you like, should reintroduction be necessary in the future. Jo - Obviously, we hope that will never happen but yes, that’s one of the reasons for maintaining captive populations. Kat - And with something like the Sumatran tigers that are so endangered that there are so few of them left, how do you go about managing that population, working out how to keep them genetically diverse and keep that population sustainable? Jo - It can be quite difficult. The one thing we rely on is actually knowing how each tiger is related to every other tiger within the population, because we do want to maximise that genetic diversity. It’s very important that we have good clean data, and we know how all the tigers are related. And by analysing that information, we can then decide which tigers should be breeding together and which pairing we need to create to make that happen. Kat - How do you work out the genetics of an individual tiger? Do you need to take a DNA sample? How do you do that apart from “very, very carefully”? Jo - For some populations that definitely is needed. But for the tigers, we’re very lucky and that has been a very long running historical stud book and we can actually trace each one of our captive tigers right back to its wild founders. So we can do it through pedigree analysis rather than DNA analysis. Kat - What would you mean by a stud book? What is that? Jo - It’s essentially a database which contains all the information of every tiger that’s been born within the captive population. And that does include recording data on animals obviously that have died, but also, those that were stillborn because that information is necessary for demographic analysis. Every time an animal is born, we enter into a stud book along with its parents and where it’s born, etc. Throughout its life, we track its movements between different zoos and obviously, the last record will be its death. Kat - What happens when another zoo wants you to play Cilla Black and says, “Oh, we’ve got this tiger…” How do you set up a tiger date? Jo - It is very difficult because obviously, the other thing about tigers is, they're such amazingly beautiful animals and tiger cubs bring in a lot of revenue for zoos. Everyone pretty much wants to be breeding tigers and we do have to limit the number of recommendations we can give because there simply isn’t space to house all the potential tiger cubs there could be. So, when a zoo does approach us, we have to see whether they have important animals and whether they should be given priority for breeding, and if not, we have to try and shift things around if you like and move tigers to the right places to meet up with the right mate. It is very complicated and it’s been likened to moving house a thousand times over with all the added stress but yeah, we get there. Kat - And what happens if you go through all these process and the tigers don’t hit it off or they don’t make cubs together? Jo - It can be highly frustrating when that happens and occasionally, there are just incidences where two animals just aren't compatible or you may find that a pair isn’t compatible in one place but if you move them to a different zoo, actually for some reason they're quite happy together. So, there's lots of other variables that affect the success and we just have to deal with those as they happen. 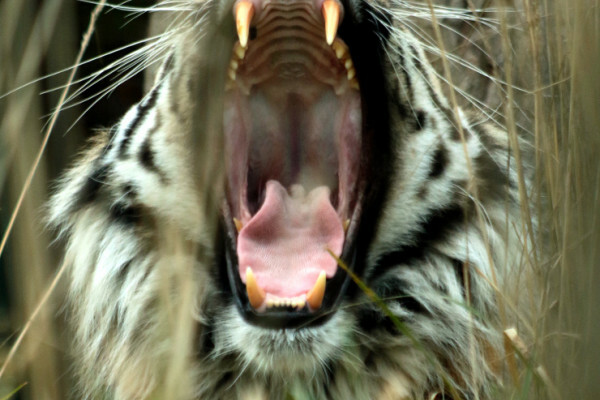 Kat - Focusing on the wonderful tigers that you have here, tell me a bit about them and their breeding history. You’ve had quite a lot of luck with them, haven't you? Jo - Yeah. We have a breeding pair. The female is Melati and the male is Jae Jae. Jae Jae came to us from Akron in the United States and Melati from Perth in Australia. That was part of the global programme that we also manage here at ZSL. They currently have two cubs with them and they previously they had three cubs but those animals have already grown up and gone to their new homes to continue the programme. Kat - So the cubs that have already headed out into the world, are they breeding yet? Have they got grandchildren out there? Jo - Not just yet. They're still a little bit young for that but maybe in the next 2 or 3 years, then yes, there will be grandchildren from the London Zoo pair which will be great. Kat - When Jae Jae and Melati did successfully raise their first cubs, how did you feel? Did you feel a bit sort of maternal or grandmotherly? Kat - Given how successful Melati and Jae Jae have been with having cubs, are there plans for having more? I mean, if they're so good at it, why don’t you have loads and loads, and loads of cubs from them? Jo - That would be lovely but unfortunately, we don’t want to have an influx of their genes within the population. So, it’s actually unlikely that they will have another breeding recommendation, certainly in the near future, and we might need to look at changing the pair we have here. Kat - Oh my! You're going to split them up. Jo - Possibly, but we will see, yes. It's not just the big mammals that need saving - snails do too! When we think about conserving wildlife, you probably think of the big stuff - pandas, tigers, elephants and other endangered mammals. But, as Dave Clarke - head of invertebrates at ZSL London Zoo - told Kat Arney, the truly endangered animals are at the other end of the scale. Dave - We’re in our Polynesian tree snail breeding room at the moment. So we’re surrounded by tanks with loads of little snails in them. They're one of our rarest animals that we keep here and one of the rarest in the world. Kat - When you think of a zoo, you probably think of the big things like tigers and elephants. It seems strange to me that these small snails are incredibly rare. What is their story? Dave - Well, there's probably far more invertebrate animals that are rare than the big animals, because the big animals are easy to see. There's a lot of invertebrates which go extinct all the time because of loss of habitat. Many of that haven't even been described yet. The other thing about that is that the invertebrates are fundamental to ecosystems so can be as important, if not more important in recycling and pollination, and things like that. So, they have a great importance which is much greater than their size. So these little guys here feed on decaying plant material which is an important job in ecosystems. They're just as worthy of conservation as a big beautiful elephant. Kat - These are Polynesian snails. What was their journey to Polynesia to here and why have you got them? Dave - Well, they were studied actually over a hundred years ago by someone called Crampton who was looking at the speciation of the snails. You get different types of snails in different valleys on each individual island throughout South Pacific. That work was picked up in the 1980s and ‘90s by a group of professors. They realised that at that time, the animals are also becoming extinct in the wild and this was a slightly complicated story of biological control gone wrong because the giant African land snail was introduced into Polynesia as a potential food crop. They became a pest and what they did to try and control their numbers was introduce a predatory snail from America called the rosy wolf snail. 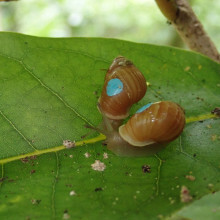 But the rosy wolf snail liked bite-size Partula snails and not the big giant land snails and set about the extinction of them on the islands. On one island, most of the species have become extinct within just 10 years. Kat - Wow! And how did you manage to salvage these snails and bring them here and what have you been doing with them? Dave - Because people were studying them, they had quite a few in captivity. We then got involved and started mounting rescue expeditions for the ones that were going extinct in the wild. Some, we were lucky with; some, we were too late. In some cases, the animals went down to tiny numbers. There's a species over there called Partula tohiveana and they went down 23 individuals at one time. But we have the opportunity to get them going in captivity but that species is over 2,000 now and we’re have been able now to release some back to the wild. Kat - That species, if it went down to three individuals and now, you’ve grown it back up to 2,000, and you're putting them back into the wild. Surely, that is now quite an inbred population. How have you been studying them at a genetic level to make sure that they're OK? Dave - What probably happened with these snails was that they had a relatively small gene pool anyway because they popped up on these Pacific islands as they were coming up, volcanic activity from the ground. So, they're less than a million or two years old in many cases. But they probably arrived just on a bird’s foot or a log or something like that so it would’ve been a small genetic base anyway. So, loss of diversity in these may not that be significant and there is perfect example there. Others, we do try to maintain as much diversity as possible. Where we’ve been able to, we’ve collected larger numbers from the wild, and we we’ve tried to manage them on a group basis. So, unlike individuals where you might know who Derek the Gorilla is, with the Partulas, we have them in tanks and you can see these are populations of snails usually, between maybe 20 and 100 snails. They are our base level group and we might out cross some of them to other groups of the same species. But in most cases, we keep them as direct lines and they do very well. Kat - So you're effectively treating each tank of snails as kind of one thing, one genetic organism. Dave - That’s right. We’ve had a stud book for snails for 20 years now. We keep records of all the different species, how many each year, who’s keeping them because it’s a worldwide programme. There are 15 institutions worldwide that keep them and we help maintain the numbers here at London Zoo. Kat - Now, I see quite a lot these tanks are empty and you mentioned you’ve been reintroducing these snails back to the wild. Presumably, they’ve gone back where they came from. What did you do with them? Dave - That’s right. A little earlier this year we did some reintroductions to the wild. We’re doing it for a few years now and 1,300 of the snails in this room went out to the wild alongside animals from Edinburgh Zoo and a few other zoos in the UK. That’s a global programme in trying to reintroduce the species back into the wild. That’s obviously the main aim of any conservation breeding programme. And it isn’t always easy to get to that point but we have done so after what's over 30 years of working with these snails in captivity. It’s great to be actually putting them back in the wild where they belong. Kat - But what about the predator that was introduced? Is it now safer for them to be there or are we just going to see them being wiped out again by these predatory snails? Dave - Well, it’s still a complicated dynamic in the wild. So the predator snail is still there but what happened, which happens with a lot of biological controls, is there was kind of boom and bust where when they first got to the island, they went, “Yippee! Loads of food!” and spread across the island within 10 years. But now that their populations have dropped right back, there's a good chance of our Partula snails surviving even with some predation. So, that’s what we’re looking at. It gets more and more complicated. Life is never easy. There's a little flatworm which has been introduced as well which can predate the snails, but what we’ve got is ongoing situation working with the Tahitian government, people on the ground studying the snails, looking how well they're doing, and we also know that animals that were released a year or two ago are still persisting in the wild. So everything is looking good. All of the species Kat Arney met in ZSL London Zoo - the blue-crowned laughing thrushes, the Sumatran tigers and the Partula snails - are small groups on the brink of extinction. That poses some significant genetic problems for conservationists, as she discovered when she called up John Ewen, ZSL’s expert on saving small populations. John - Understanding the genetics of the population of the species is critical when you’re planning for recovery. However, I think what I voiced and what I always encourage others to do if I'm meeting with different groups on conservation problems is take a step back and try and understand first what it is they're trying to achieve. In most cases when we’re looking at small populations of threatened species, and we’re worried they're facing an extinction event so we’re trying to recover them. So we’ve got this core ‘biological objective’ which is driving our management choices. Then we can start thinking about how genetics plays a role in their recovery. So, it depends what you want and for me, it’s about recovering populations and recovering a species, and then I start considering how genetics plays a role in that. Kat - When you do get to the genetic part of it, what sort of things are you thinking about and how do you sort of measure the genetics of a small population? John - So, I immediately get worried when I'm faced with the situation where we’ve got a small and isolated population because that’s exactly the situation which can get you into trouble from a genetic perspective. And those types of scenarios, the genetics of those populations will primarily be driven by two processes – one is genetic drifts, so loss of genetic diversity, then a second problem around inbreeding, so breeding between relatives. And both of those things will change the genetic constitution of their population. When that happens, you can run into problems. So the two main problems that happen will be the risk of inbreeding depression and also, the lack of ability for these populations to adapt in the future. John - No. I mean, we start talking about inbreeding depression we’re starting to link the genetic effects on fitness. By fitness, I’m starting to look at those demographic parameters which are important for a population to persist. So, we have things like impacts on reproduction, impacts on survival and susceptibility to diseases, and other stresses from the environment on that species. Kat - Is there any point when you're looking at a population that genetically speaking, they are just gone, they're too far gone, there's no way you can get them back? John - No. I don’t believe that at all. I think that adds a separate challenge that we then have to deal with. So then we start talking in my world about recovery and how we might want to try and manage recovery, linking in with genetics then we want to try and recover some of the genetic diversity. So there are options in how you might go about doing that and it really depends again on what your overarching objectives are to the management of that population. At the most basic level, we know that diversity arises because of mutation and that this process requires large population sizes. So, in any case, I would be trying to grow my threatened population to as big as the population size as possible and as quickly as possible so I can remove any further loss of diversity through this random process of drift and I can create a situation where more diversity can arise through mutation. Kat - So you're basically trying to grow some weird mutants to boost your population? John - Well, not trying to purposely grow something like a weird mutant. This is what natural populations do. This is how genetic diversity arises. So, we’re just trying to put that population back in a place where nature can do its work. Kat - What are your hopes for conservation in the future? What really needs to happen to make a difference and to save these species that do seem to be going extinct at an incredible rate? John - Well for me, I'm actually much more of an optimist than a pessimist and I think the tools that we are using currently to recover threatened species, they can work and we need much more investment in them, and genetics certainly is an important component of that an informs them. And so, with this increasing technology that we have and with dedicated people, we can bring species back from the brink of extinction. It works and there's evidence out there that works. So, we just need to do more of it. Kat - John Ewen, from ZSL. Fascinating flowers at this year's JBS Haldane lecture. Every year the Genetics Society awards a number of prizes to outstanding researchers. The JBS Haldane prize recognises an individual for outstanding ability to communicate topical subjects in genetics research to an interested lay audience, and this year’s winner is Professor Enrico Coen from the John Innes Centre in Norwich. He’ll give his prize lecture on the 21st of November in the hallowed red velvet lecture theatre of the Royal Institution in central London. It’s open to the public and tickets are on sale now. Kat Arney caught up with Enrico ahead of his talk, and asked him why Haldane - a brilliant evolutionary biologist and geneticist - is such a great icon for science communication. Enrico - Haldane was a fantastic scientist and communicator. He had great ideas about the theory of genetics and how he might develop that theory, and also an appreciation of experiments. But he also communicated it to a very broad audience. He wrote several popular science books, wrote articles about science, and I think he was just generally fascinated by the challenge of how you can relate complicated ideas to a broad audience. Kat - But why do you think it’s important to actually communicate genetics, communicate science to the public? You know, it’s hard stuff. why do people need to know about this? Enrico - Science is just one of the most amazing things that we’re able to appreciate and it’s part of our world. It’s part of how the world works. It’s part of the fascination with how things are. I think it’s just our duty in a way to try and share what we’ve discovered about that world. Kat - So in terms of your own work, what is your passion? What is your genetic interest? Enrico - One is to do with the development of shapes and forms and how is it that a group of cells, a small group of cells in an embryo, or in a bud of a flower can turn themselves on their own into amazing structures. Not just humans but plants, flowers with amazing shapes, leaves with all sorts of different contortions. How does that happen because nobody is telling the plant how to do that? The plant has to do that somehow on its own. So, when you put a seed into the garden and that turns itself into a daisy or a rose, how does that work? The other thing is the historical question – how did that variety of forms arise? How did it evolve? What were the factors, the forces in evolution that led to this diversity of different shapes and forms, and colours that we see when we look out in our garden? So both of those aspects fascinate me – both the development of structures and how they’ve evolved overtime. Kat - You'll be doing your JBS Haldane lecture. What will you be talking about? Give me a little run through, a sneak peek of what people can expect. Enrico - So, I’ll begin by really asking the audience to imagine they're a Martian landing on Earth and trying to make sense of the amazing things that humans have made. So suppose you went around and did see things like cars. One of the first things you might think about is how humans have made things that seem to be tailored to their environment. Cars have wheels so they can go efficiently on roads. Boats have hulls so they can float in the water. Snow mobiles have skis to steer them. So everything seems to be adapted to its environment. But then if you look a bit more closely, what you see is actually there's lots of things that humans make that aren't – strictly speaking – related to adaptations. For example, in some countries you find people drive in the left. In another country, the people drive on the right. That’s not to do with adaptation to local conditions. There's something else going on there. So what's that about? There's some historical process that’s somehow creating boundaries and differences between these different countries. And in the same way, what I try and convey in my talk is how, when in a sense we’re Martians, when we’re trying to understand how biology works, we want to make sense of all these different biological forms that we find – plants or animals or microbes. What I want to talk about is how we’re discovering all these processes really in a way that we’d never appreciated before, the advances we’ve made in being able to study genes. It’s now possible to sequence genomes, entire genomes very quickly and that’s revolutionising the way we look at organisms and it’s showing us this historical component that we only have a sort of hint of previously and it’s now being revealed for the first time. Kat - If JBS Haldane was alive today and he could see the genetic revolution, all the information we have, what do you think he would say? What would be really blowing his mind today? Enrico - I think what would blow his mind is the fusion that’s happened between people who study gene functions and people who study populations. Because one of Haldane’s great contributions was the idea that genetic variation should be studied not just in terms of small families but whole populations, thinking about the frequencies, or the rates at which mutations happen in the population as a whole. And because we can now sequence genomes and discover their structure across lots of different individuals, first of all, he'd be amazed if that’s possible at all to be able to sequence an entire genome and understand the genetic code. But also, I think he would struck by the fact that we can now look at populations in a totally new way. We can look at variation across a whole population of individuals and appreciate how that variation is behaving. Enrico - I suppose the scientific love of my life are snapdragons. About 100 years ago, snapdragons were actually the best understood plant in terms of its genes than any other plant. 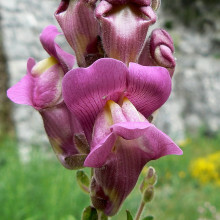 They fell out of fashion for a while, largely because you can't eat snapdragons. I mean, they're not very tasty things to eat, but they were very good for studying genes. So really, over the last 30 odd years, I’ve worked consistently on these plants trying to understand how their patterns and forms generated and they’ve been remarkably sort of fruitful. Kat - Do you grow them in your own garden? Enrico - Yes. We have some in our garden and I always look at them in a slightly different way perhaps than I would look at all the other flowers in the garden. They're my friends. I know them very well. I know the variations that I see. Instantly, I can tell that’s that gene that’s segregating, that variant between one snapdragon and another. So yes, they're like familiar friends that live with me. Kat - Enrico Coen from the John Innes Centre in Norwich. And you can buy tickets now for his award lecture on Tuesday 21st november, starting at 7pm at the Royal Institution - tickets available from the RI website. Our Gene of the Month is in the pub already. And finally, it’s time for our gene of the month, and this time it’s Happy Hour. If you’re anything like me, the only way to get through the dark nights of winter - not to mention the endless torrent of terrible global news - is to get drunk. But the difference between passing out after a single shot or only getting blotto after a whole bottle might be in your genes - at least, if you’re a fruit fly. The Happy Hour gene was discovered in 2009 by researchers who took a bunch of fruit flies, plied them with alcohol, then looked for mutations that meant the flies stayed standing long after their regular comrades had keeled over drunk. These hardened insect boozers turned out to have a mutation in a gene involved in sending signals inside cells - making a type of enzyme known as a kinase. The Happy Hour gene normally works as part of the EGFR signalling pathway, which is involved in a huge range of fundamental biological processes including telling cells when to divide. Unsurprisingly, faults in EGFR signalling are linked to cancer but in the case of alcohol consumption, Happy Hour seems to be playing a role in the part of the fly brain that responds to the chemical dopamine, which helps to control pleasure and reward. Intriguingly, when the researchers gave normal flies a cancer drug that blocked EGFR signalling, they got knocked out by alcohol a lot faster than those who hadn’t taken the treatment. 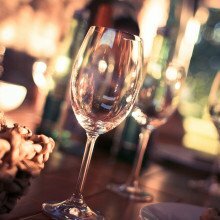 The same effect worked in mice and rats, eventually putting them off booze altogether, suggesting that this could potentially be a way to treat alcoholism in humans by making the unpleasant effects of alcohol kick in quicker. Do the different stages of a butterfly all have the same DNA? Previous Palaeo Ponderings: Can You Dig It?